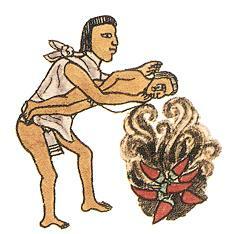 The Aztecs would punish disobedient children by making them inhale smoke, sustaining them on a blaze in which they threw spicy peppers. See also this illustration. Punishment of children is a hotly debated issue. There is general agreement that praise and reward for desirable, "good" behaviour are the cornerstone of education of children. However, experience with "laissez-faire" education has convinced many people that if the child is willfully disobedient it needs to be punished. Children need to explore their boundaries - if no limits are set, the child will feel abandoned and uncertain. Punishment can be a way of setting limits. F/f spanking illustration by "Jim Black" (Luc Lafnet). In traditional society, a common and accepted punishment of children is spanking them (a form of corporal punishment delivered to the buttocks — see also spanking of children). Although the rate of it's usage is decreasing, and even banned in some places, it is still prevalent in schools and homes, and around 70% of people in the US support it's usage. It is legal for home use in all US states, legal in public schools in 19 US states, and legal in private schools in all states with the exceptions of Iowa and New Jersy. Although there are correlations with spanking and negative effects, spanking itself has not been shown to cause harm. Also see the articles pro-spanking and anti-spanking. Spanking art of children often depicts a period (in some cases a more or less imaginary period) when children were routinely disciplined by parents. Such art refers to a simple world, where there is right and wrong, good behavior is rewarded and bad behavior is punished. The child is free in his acts, as it is irresponsible, and with an absolute claim to forgiveness after receiving a just punishment. The child is "taken care of" by a loving, protective parent in a physically intimate way. Not all child spanking art follows this model, however. Other typical children's punishments include time-out (e.g. corner time), mouth washing, extra chores, writing lines, murga, finger stocks, kneeling, grounding, etc. Spank with Love - a parenting website on how to spank children.